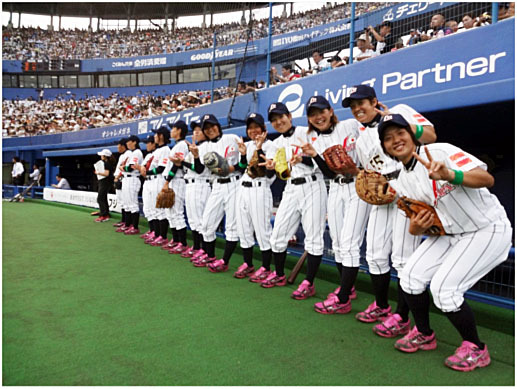 (Matsuyama, Ehime) Nippon Professional Baseball (NPB) invited Japanese Women’s National Team (Madonna Japan) to Matsuyama City and introduced them to capacity crowd in the Botchan Stadium before the start of All-Star Game on Saturday, July 14. The Team Madonna Japan will conduct a baseball clinic to juniors at Tokyo Dome on Tuesday, July 24 afternoon, by the invitation of Japan Amateur Baseball Association (JABA) and will throw ceremonial first ball afterward at the final game of JABA’s Intercity Championship which have been going on since July 13. The reigning world champion of 20 players led by Captain Akiko Shimura and Manager Hiroshi Shintani will participate in the 5th edition of the Women's Baseball World Cup in Edmonton, Canada from August 10.